How to choose the right Hosting Service for your business. ABOVE - A snapshot of the top ten hosting companies in the search results. In this great big world wide web, there are literally hundreds of companies that offer hosting, email, and even domain name services. The number of companies to pick from has grown exponentially since the 1990’s. Now, more than ever, hosting companies have learned how to manipulate the consumer into purchasing their services instead of their competitors. Today, hosting companies are fine-tuning their approach to the services they offer. As technology becomes more available their services become more expensive and less dependable. These companies understand more than ever, how to get their pages to the top of the search results. This article’s purpose is to reveal the dishonesty and unethical business practices that are found by taking a look at the truth; who really owns what company, and what are real people saying about their reputation. Unarmed with the correct technical information about your needs could cost you your business!! This article will clear away come the mystery surrounding what you need to know to choose the right company for your website’s continued success. Every hosting company is not created equal! We begin our journey how most of us find a solution to a problem; an internet search. Unfortunately, to find a good hosting company, this is the absolute worst approach, but it’s the only way we have to wade through these companies services to fulfill our businesses needs. Finally, after searching for the best hosting companies, a comprehensive list displayed in the search results. It's called the top ten hosting companies. Above is the actual screenshot from February 11, 2014. The first company in this list is iPage. I was extremely surprised to learn that #1 iPage along with, #5 Bluehost, #6 Hostgator, #2 Justhost, and #8 Fatcow are all owned by the same comapny; EIG. Endurance International Group formerly Bizland owns about 60 hosting companies in this country and worldwide. #3 Web.com, also owns #4 Network solutions. Who could trust a company that deceives its window shoppers by claiming to be one company, but really is over sixty different companies just copied and rebranded over and over again? There is something wrong with this. This leaves three other companies #7 1&1, #9 Hub, and #10 Godaddy. Out of these three companies left Godaddy is probably the most familiar because they are the most profitable and have an advertising budget so big that they took out a 30 second slot at the superbowl costing 4 million dollars. How could a company that claims to offer so much justify an expenditure that large to go to broadcasting company instead of increasing its server space and the resources they offer to their paying customers? For your information, Godaddy also owns Media Temple, Tech Crunch, outright, and is growing by the day. If you are a techie like me, I was saddened on the day that Media Temple was bought. There are now two companies left in the running; #9 Hub, and #7 1and1. The company Hub, actually called Web Hosting Hub, has a sister company called inMotionHosting. At the time of the writing of this article Inmotionhosting is hosting this website and we are 5 days into our relationship with a 90 day return policy. We will soon find out how good their service is from first hand experience. So far, there is nothing negative to say about either of these companies. Also, you should always check where the company is located and choose one that is local to you and your customer base. Many offer unlimited space and domains? Most of these companies all offer unlimited space and unlimited traffic with a free domain name for just a few dollars a month. What they do not tell you is that they limit your resources on their server sshared server which is filled with other people’s accounts and services to 1 GB of Virtual memory each. This is probably 4 to 16 times less resources that you have on your home computer. 1 GB of VRam is NOT enough to run an unlimited amount of websites. It is barely enough to run very busy website or a few slow ones. While this will ensure that your website won't crash because of someone else's on the same shared server, it also limits the amount of visitors you can have at your website during peak hours. If you don't believe me check your resource usage in your control panel. Sure you could pay $20 to $200 for your own private VPS. But, who needs all those resources unless you are getting thousands of unique visitors per month? If you have any experiences that you would like to share please add a comment below. 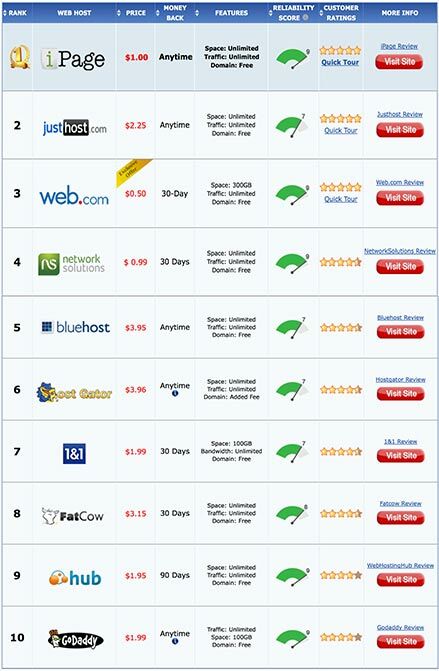 This will help anyone looking for a hosting to make a better more informed decision with their advertising budget. Article written by Jeremiah Williams, a free soul born right in the heart of Zion. Links to information in article. Works Cited. ← Older: Readability: Does your reader understand your writing? Are Humans the New Cash Crops?